Sipping your morning cup of coffee or espresso has probably become a ritual that has become ingrained in you over time. If you are like most caffeine enthusiasts, having to forego your daily brew can make you moody, uncomfortable, or even make you feel lethargic. Unfortunately, when you head out into the wilderness with only a minimal number of supplies, carrying your trusty espresso machine is just not possible. This typically means that you have to resort to drinking… instant coffee. For anyone who has ever had a decent cup of coffee, just the idea of instant coffee can be off-putting. For instance, do you know how instant coffee is produced? Essentially, it is made by brewing huge amounts of coffee at once. After this, it is dried one of two methods – spray drying or freeze drying. Spray drying involves the brewed coffee to be sprayed in a hot and dry chamber until it turns into dehydrated granules. Freeze drying is when the coffee is frozen, ground into pieces, and then placed in a heated vacuum which results in the granules that you see in your grocery store. Just thinking about this process makes it impossible to compare it to a cup of espresso made from freshly ground, perfectly roasted beans. Of course, it is not just about the process. The main reason that instant coffee is unappetizing is the taste. Since it has had to go through all of that processing, much of the flavor is lost along the way. This is how Italians make traditional espresso in their homes. Due to the mechanism involved, you should be able to replicate this outdoors as well. This is a relatively lightweight pot so you will have no problem simply placing it in your pack and carrying it with you. The other benefit is that the Moka pot works over a stove and will do well over a campfire. As it is made of metal, you don’t have to be concerned about using it on a makeshift stove. That being said, the handle on most Moka pots are made of plastic or rubber. Therefore, you should be careful that this part doesn’t melt off while you are using it. So, how does it work? Well, the Moka pot is made up of three compartments. You will place the water in the compartment that will be closest to the flames. Above this is where the coffee grinds go. Once the water starts boiling, it will force its way up into the grinds, allowing some steeping to occur. The final product ends up in the topmost compartment. The coffee from the Moka pot is strong and very close to the espresso flavor that you are used to. You will need to make certain that the grinds don’t percolate for too long if you want to avoid a burnt taste. If you want some cremam with your espresso, make sure to tamp the grinds down a bit before placing them in their compartment. You can think of a manual drip coffee maker as an exposed version of what you might have in your kitchen. This product cuts to the quick with just the basket where the coffee beans percolate. You place your cup or mug underneath it. These type of coffee makers do require to use a filter so you will need to carry a supply with you. They are also quite light, so there is no fear of them weighing you down. These coffee makers are made from various materials including glass, porcelain, plastic, and stainless steel. Since you are camping, you are going to need something more rugged. This is why it is best to stick with either plastic options or stainless steel. 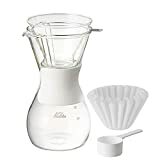 If you prefer plastic, the Melitta Brewing Cone is a great buy. If stainless steel is more your thing, then the Kalita Wave is designed to balance perfectly on top of your mug. Since this is a drip coffee maker, you will need to change your methodology a bit to make espresso. Pour the hot water in the grinds and let it steep for about half a minute. Then, pour the rest of the water into the grinds and allow it flow through. These coffee machines do only make just enough coffee for one person although, with a refined technique, you could get a couple of espressos out of it. Since this option does require some expertise, it is not necessarily the best idea for those who aren’t well versed with espresso making. The tech world has caught up with the fact that even those with wanderlust still want to be able to sip a decent espresso. This has led to more than a few portable espresso machines. These hi-tech products essentially just need you to use coffee grinds and pour hot water – they take care of the rest. Of course, this can be a little pricey although the Wacaco Minipresso and Staresso Espresso Maker aren’t too expensive. Let’s see how these options work. The Wacaco Minipresso is one of the most popular choices on the market. You simply place the grinds in the compartment, tamp it down and then attach it to the other compartment. This is where the hot water goes. Once you have closed the Minipresso, you just have to push on the pump until the espresso pours into your cup, perfectly made. The No products found. works in pretty much the same way, except that the pump is at the top of the machine. One of the advantages that this model has is that it can also make cappuccinos. You simply have to add milk to the machine once the coffee is made. It will then froth the milk to create a cappuccino. The Handpresso Outdoor Set has a few more components. It comes with its own thermos and the pump for the espresso actually tells you how much pressure that you are using. Therefore, you get to decide how much pressure to apply when creating your espresso. 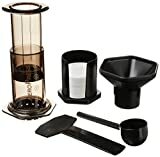 If you are looking for something a little cheaper, there is the AeroPress coffee maker. The distinction, here, of course, is that it is a coffee maker, not an espresso maker. However, this machine is actually capable of producing an espresso as well. You can even make double espressos in one go if you need that extra shot of caffeine in the morning. Everything that you need is available with the AeroPress and all you need additionally is the coffee grinds and the water. The AeroPress is so popular because it produces a very clean cup of coffee, without any grinds lingering in your drink. Also, because of the way that is made, you can expect that the strength of your espresso will be maintained. In addition, there are numbered measurements on the coffee maker itself. This takes a lot of the guesswork that is otherwise involved in making your espresso. As mentioned, another perk is that you can make more than espresso at one time which is great if you are camping with someone else. So taking your French Press on a camping trip with you is not a viable option. The next best thing would be a portable design. Using these, you can make an espresso for yourself. Now, the portable versions may not actually look much like the French Press that you are used to. Nonetheless, they do work in a similar manner. They take up as much room in your pack as a regular coffee mug would. One of your choices includes the GSI Outdoor JavaPress. Although it mimics a travel mug, the JavaPress has everything you need built into its design. This includes a mesh filter as well as a plunger. Therefore, you don’t have to take any additional tools with you. The glass interior is shatterproof so there is no danger of accidentally cracking the utensil. If you want something a little sturdier, then the Snow Peak titanium model will be just up your alley. Since it’s made of titanium, you will actually be able to place this French Press directly on top of your campfire. The key to a delicious cup of espresso is the kind of grind that you use. Ideally, you should attempt for a grind that looks like sugar granules. You should avoid overly fine grinds as this will simply cause your espresso to taste burnt. On the other hand, a grind that is too large or coarse will cause a weak flavor that is equally unpalatable. Always check for a grind that is somewhere in the middle. As you are probably aware, espresso tastes better when the coffee beans are freshly ground. Of course, this can be a little tricky to manage when you are camping. One solution could be to grind the beans just before you leave home and seal them up well. 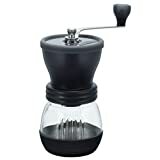 If you are really picky about your coffee, however, you can get a small, hand burr grinder. The Hario Ceramic Coffee Mill Skerton is one of the smallest on the market. Ceramic conical burrs ensure a precise, uniform grind. Nonslip rubber base keeps the mill in place during grinding. Ergonomically designed crank handle detaches for compact storage and easy travel. So tamping is quite significant with espressos. You need to make sure that you tamp the grinds just enough to make that perfect cup. Anything less or more and the coffee will not taste the same. This is why you may want to carry a tamp with you if the machine or product that you are using doesn’t come with one already. As with any good cup of coffee, you have to watch the temperature of the water. You may be surprised to learn that the best cup of espresso is not actually made with boiling water. Instead, you should aim for water that has been heated to between 92°C and 96°C. If you really are dedicated to your craft, you might feel that it is necessary to carry a thermometer with you. Of course, you can always settle for taking the water off the fire, just before it begins to boil. A shot of espresso is usually around 15ml and a double shot is about 30ml of liquid. This means that for a single shot, you will need about 7g of grounds and a double shot requires 14g. Bringing scales to a camping ground doesn’t really make much sense, no matter how much you like your espresso. An easier way to do this is to pre-measure at home. Then place each amount in a small bag and seal it. This way, you will know precisely how much to use each time. So, this is how you can make espresso that is both delicious as well as easy to make. Most of the machines will produce a precise cup of espresso. If you choose to do it by hand, perhaps with a Moka pot, it will take some getting used to. You should always try to perfect your technique at home first so that you are well prepared when you go camping. Then, you will be able to take a little bit of your favorite part of your day with you when you head out into the wilderness.